It’s officially entertaining season. Friends and family will be gathering together to celebrate the season and each other. 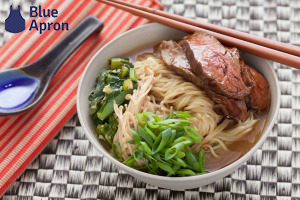 Since it’s time to entertain, you’re probably planning out your tables ape for the big meal. What theme will it be? How many people are coming? Which fork goes where? Does Aunt Ruth want to sit next to cousin Lenny? 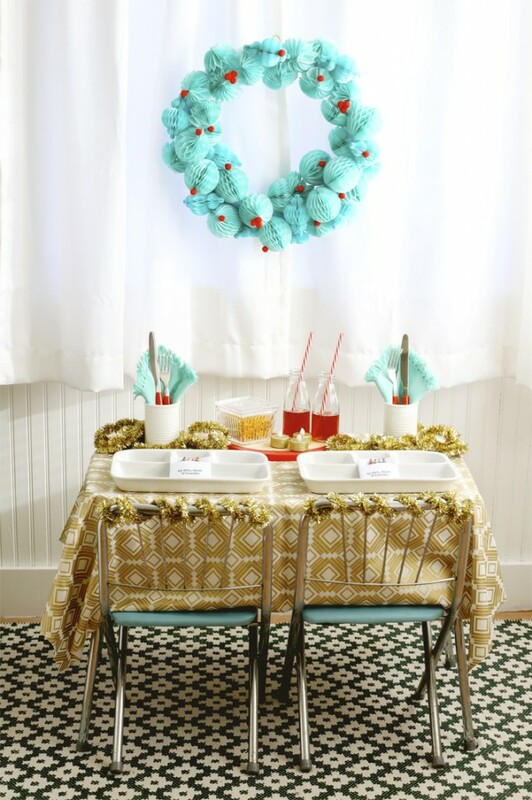 I can’t help you with those questions, but I can help you plan out an adorable kids tablescape. Don’t forget about the kiddos! Growing up we always had a kids table and sometimes we still have a kids table that the “kids” sit at (even though we’re all in our 20’s and 30’s), but I loved it. You get to be silly, and maybe feed the dog some veggies, all while your parents are busy and distracted and the “big person table”. Wayfair recently challenged me to come up with a lovely tablescape for the kids. I explored their site to find just the right supplies to put it together, and I’m loving how it turned out. While wandering their site I noticed a set of these adorable ceramic TV dinner trays and I knew what my theme was going to be: 50’s TV Dinner for the Holidays. I also found some other great items to go along with this theme (like those ceramic cans and glass milk bottles). When putting together a kids table, there are a few things you should think about and plan to have for the kids. – Kids are always hungry. You feed them, and they’re starving 30 minutes later. So, you need a snack at the table so the kids don’t lose their minds and meltdown if dinner takes a little bit longer to finish (you know that turkey can be trouble). I provided some yummy crackers in this adorable tasty container. – Give them something to do. Kids love the word “bored” and tend to use it a lot. I don’t think you can completely stop that word from appearing, but you can do something to entertain the kids for a bit. 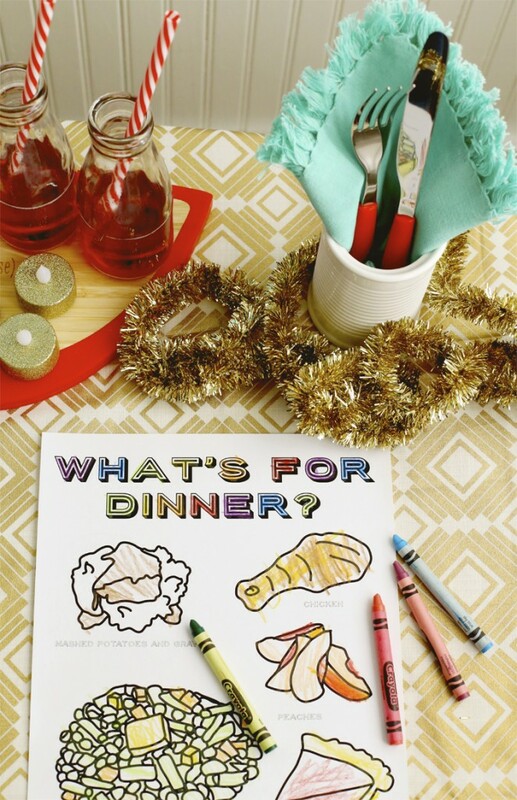 I provided a free printable What’s For Dinner coloring page that you can print out and use for your kids table. 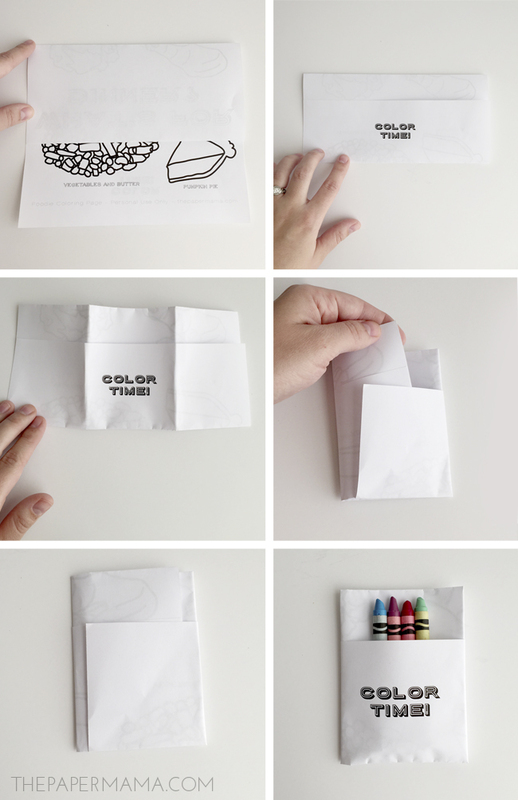 Check out the tiny kids menu folding tutorial below to see how to fold this page into a little pocket to hold crayons. 1. Print out the coloring pages (set to two sided). 2. Fold down the top of the paper and leave about 25% of the coloring page showing. 3. Fold up the bottom portion of the page. 4. Fold the left and right side of the the page, leaving the “color time” in the center. 5. Tuck in one of the folded sides of the page into the other folded sides. 6. Add crayons, and you’re done. 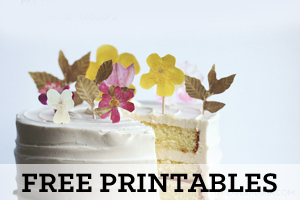 – Maybe skip the breakable items on the table, and go for plastic decor. My daughter is pretty good with breakable items, so I wasn’t worried she would break anything. If your kid is a bit younger and maybe likes to throw things, I’d skip the glassware. As far as candles go, I did pick out these adorable glitter flameless candles so the kids could also have some lovely candlelight for their meal. 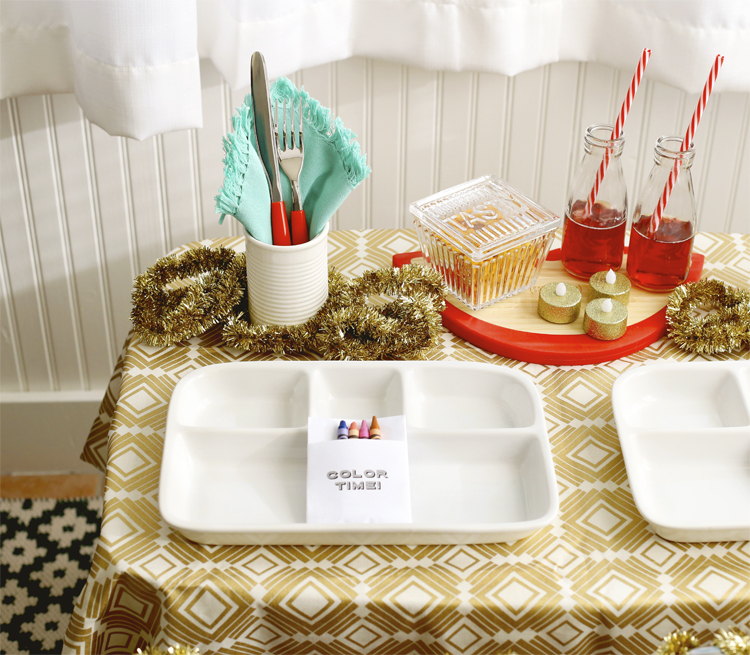 You don’t have to go all out to create a fun kids table, just get creative with items you already have from home and maybe add a couple of new purchases to make it more exciting. 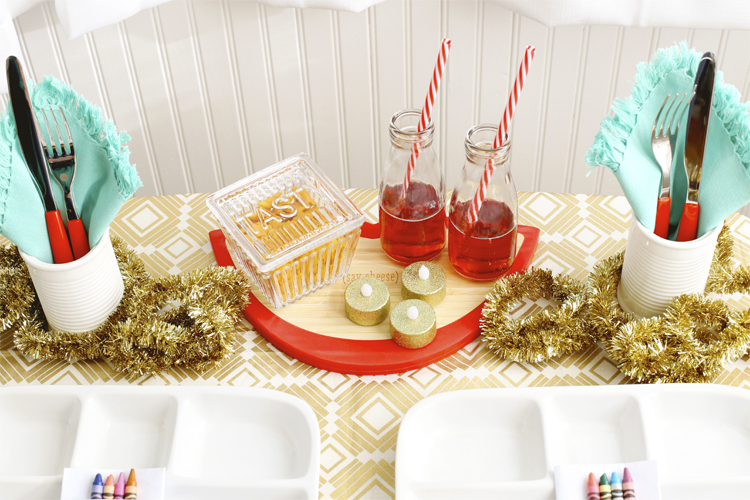 If you want to create this look for your kids holiday table, check out where I got them here: TV Tray Plates, Fringed Napkins, Tasty Storage with Lid, Dairy Bottles, Lips Cheese Board, ceramic can jar, gold glitter battery operated candles, indoor or outdoor rug, and flatware. 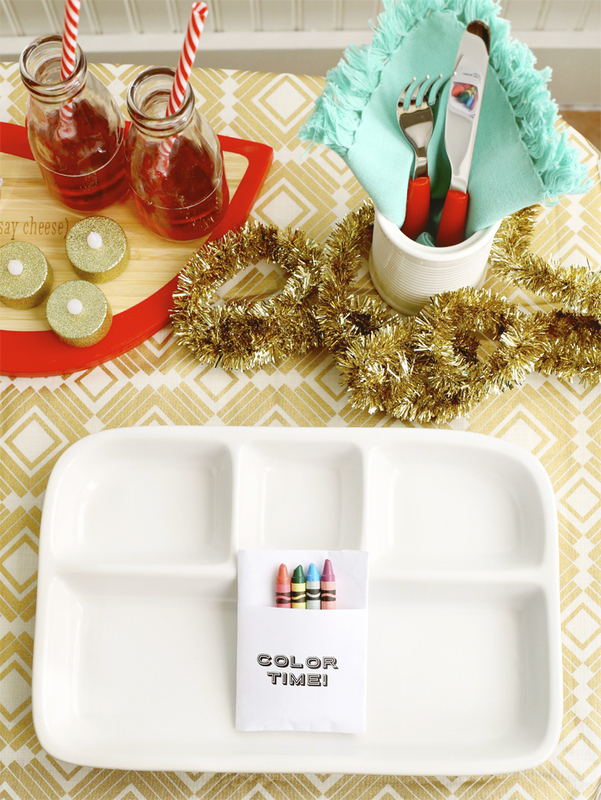 Does you family do the holiday kids table? 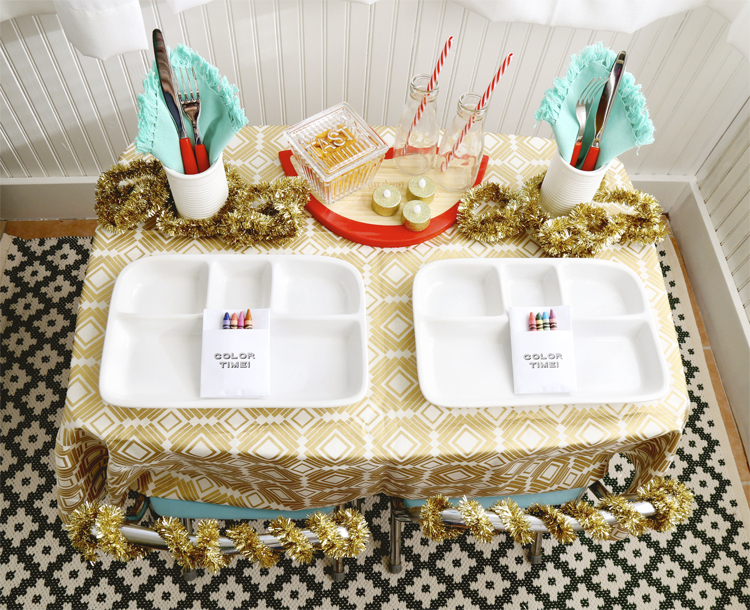 You can check out more kids table ideas on Instagram by looking at the #MEETMEATTHEKIDSTABLE hashtag. Wayfair provided products from their site for me to create this post. 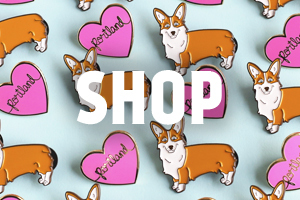 You can check out this link to explore past DIY Days. I want to see your creations! Share what your making with me on Instagram. It could be one of my DIY’s, or a project you’re working on. Share with my IG account @thepapermama and use the hashtag #papermamafriends.